dd a touch of class to your home with a new and exciting architectural product that is both elegant and affordable, the finishing touch that will make your home the showplace it deserves to be. Custom widths are available to fit your needs...Just Ask! 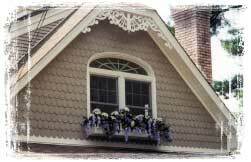 apital Balconette™ window box holders are one-piece, fully assembled, primed and painted. They consist of three sides and floor (with built-in mounting brackets) for enclosing flower boxes or dressing up a plain wall or garden wall. All designs are based on our popular Capital Crestings™ crestings and finials which are reduced in size for this application. Please see each design for actual heights. These easy to install, unbreakable window box holders weigh in the range of 8 to about 40 pounds. All are fabricated in ASTM A 36 plate steel. Capital Balconettes are made with a protective guard rail along the tops of the spires; customers may opt to eliminate this. 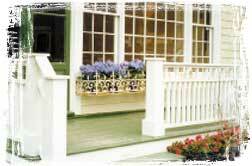 As are all of our products, Capital Balconettes™ are U.S. made of U.S. materials. Although we offer a wide variety of styles in stock and ready to ship, we have no problem with custom styles, custom sizes, or even custom colors. 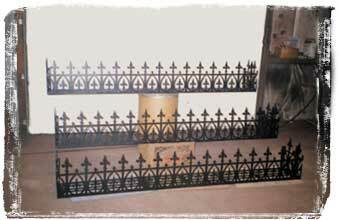 CAPITAL BALCONETTES™ mount to the wall on both outer sides of the window. The window box holder will fit windows with outer dimensions that are at least 2 1/2” less than the given size of the window box holder. For example, a 36” window box holder will fit around a window no greater than 33 1/2” wide. See picture and diagram. Not sure? Just don't understand?